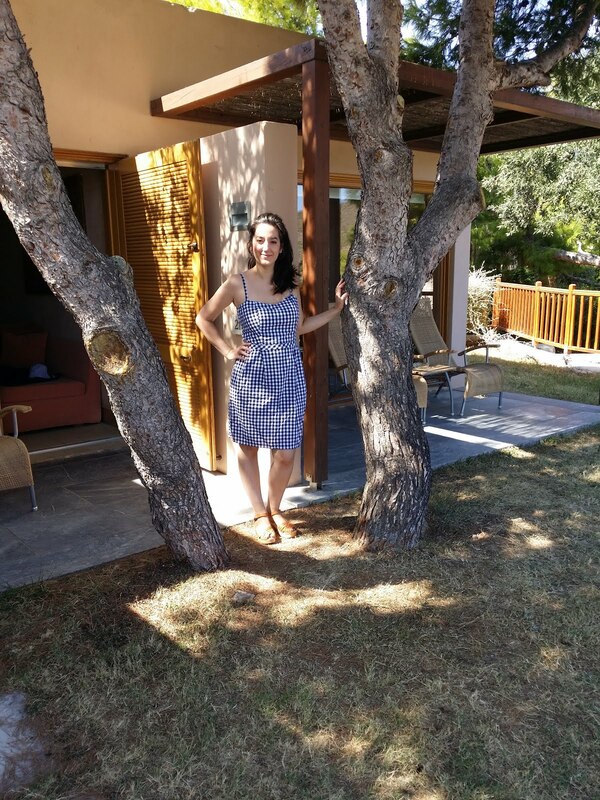 I made the beautiful Silvia dress by Salme patterns! I bought the pattern back in April when I was searching for the perfect dress to wear on my son’s baptism day. I couldn’t decide between the Betty dress by SOI or the Silvia dress. The plan was that when the two dresses were finished I would then choose which one I was going to wear on this special day! 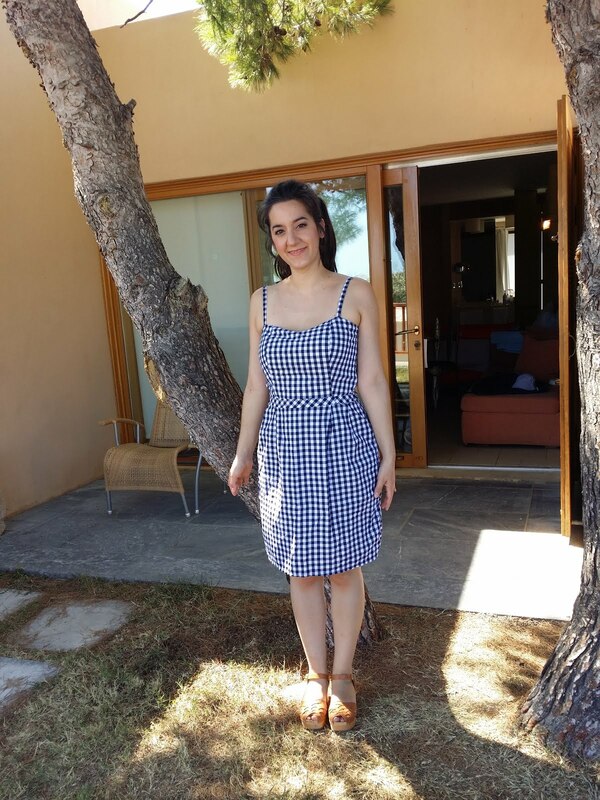 The thing is that I sew first the Betty dress which I loved it as soon as I finished it and as a result I didn’t make the Silvia dress until now. You can read more about me Betty dress by SOI here. 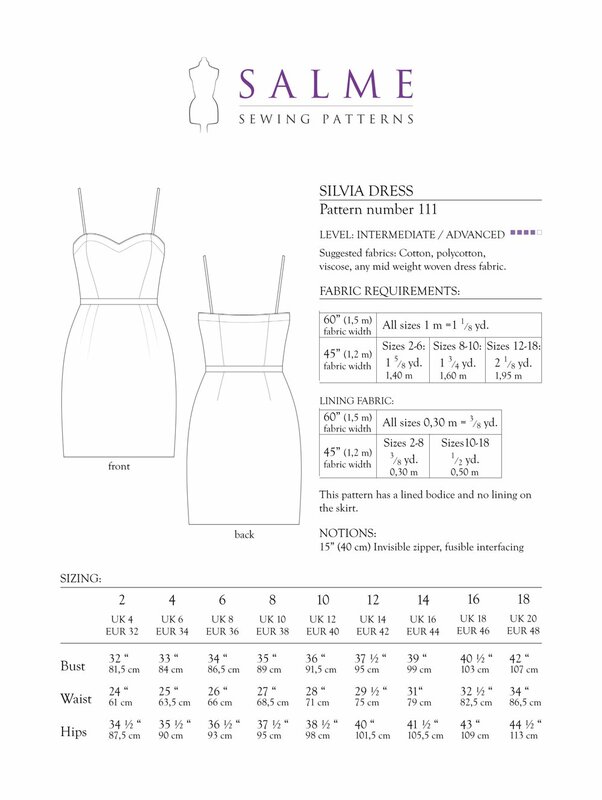 Silvia dress is a pdf only sewing pattern by Salme. It has a fitted bodice with princess seams, thin shoulder straps, a waistband and a pegged skirt. The bodice has facings and it is fully lined. The dress fastening is an invisible zipper on the left side. The pattern requires only 1 meter of fabric and 0.30cm of a lining fabric. 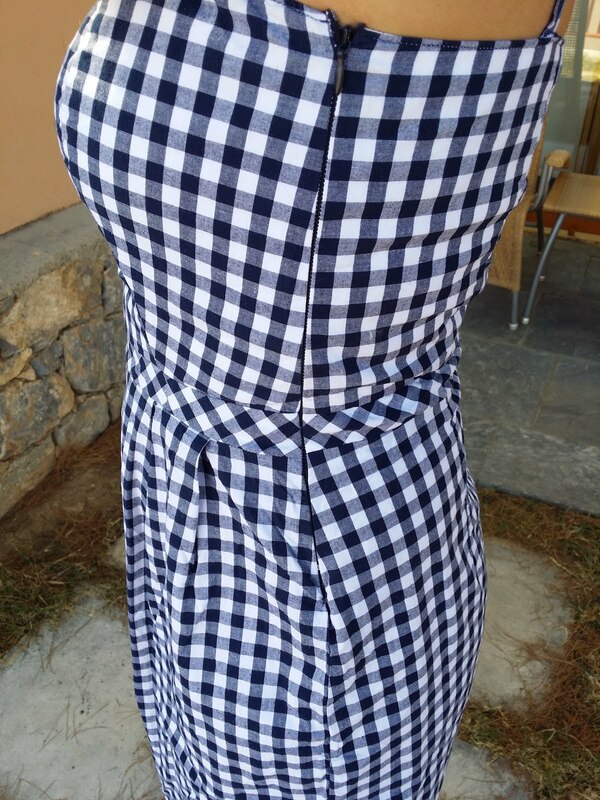 I used a gingham fabric with navy and white as my main fabric. I bought it for 6 euros per meter from ifasma.eu . Also, I chose to line the entire dress as I prefer to do most of the times. So I bought a viscose lining fabric in off white colour from my local haberdashery for 4 euros per meter. Finally, I used 40cm invisible zipper in navy that I already had in my stash. The thing I would like to mention first is that the pattern comes without seam allowances (s.a.). 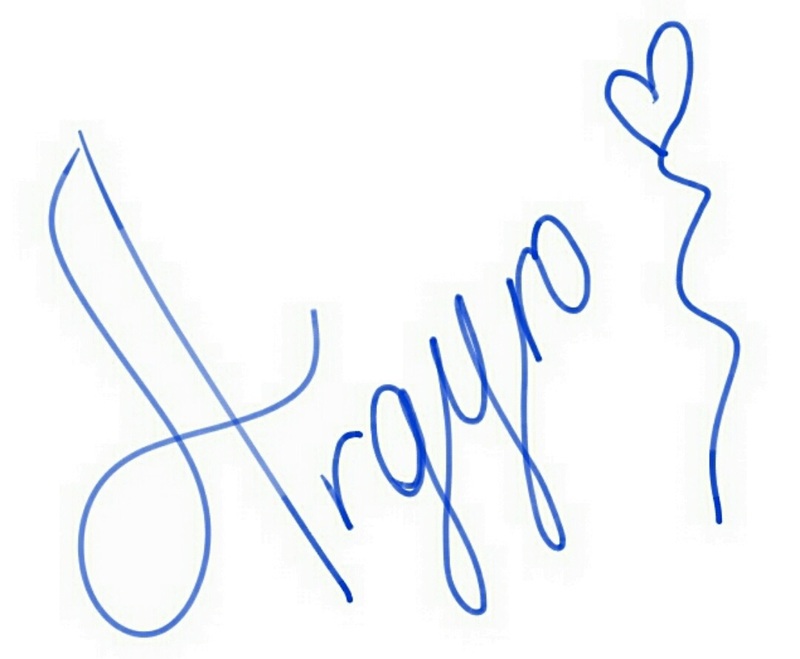 – dramatic music – Ha ha! The pattern pieces are small so it isn’t that hard to add the s.a. Still, I would prefer if the s.a. was already included on the pattern pieces. Moreover, I had to make the waistband piece and the straps by myself as they only give you the measurements to DIY them. The thing is that as a result the waistband doesn’t have any notches. Notches would be really helpful in order to align the princess seams of the bodice with the pleats of the skirt correctly. Like I said, it isn’t necessary but it could be handy. Guys, really..if one day I will design and will release any sewing pattern I will include seam allowances! That is a promise! I cannot understand why any company do not include s.a in their patterns. If anyone know which is the purpose of this, please enlighten me! I made size 10 for the bust and I graded to size 12 for my waist and my hips. The pattern requires to cut facings for the bodice out of the main fabric and line the rest of the bodice. However, I decided to avoid making facings and instead I lined the entire dress. I understand why facings are important. They stabilise the neckline better and you can also avoid exposing any lining. I made the lining pieces by using the skirt and waistband pieces. I sew the dress in a way that the wrong sides of the main fabric and the lining are facing each other. The finished dress, ended up with a quite roomy bodice at the bust area. So, I took 1,5cm from each side under the armholes, decreasing the excess amount of fabric gradually just before the waistband. As a result the fitting got better but still does not look as good as I would liked to. I tried to pattern mach every single piece except the waistband which I cut it on the bias. After removing the excess fabric from the sides, I ruined the whole pattern maching thing. Finally, I hem the dress by turning the hem 1cm twice. I like the dress but I am not loving it. The lack of the facings may cause the ill fitting across the bust area. 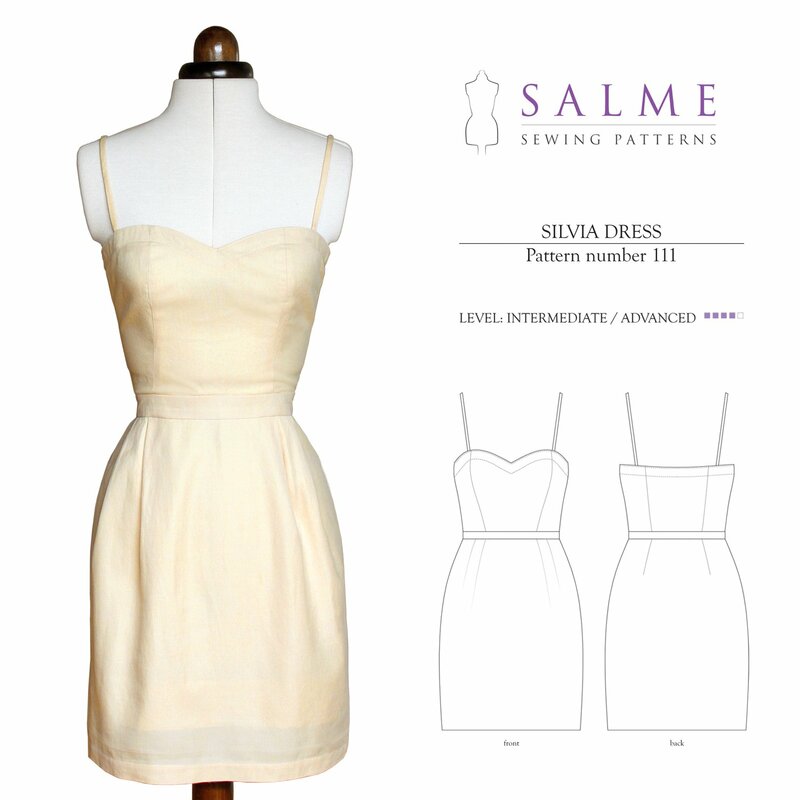 I do love the pattern even if I should make a few changes in a future Silvia dress. Next time, I will include the facings and I will remove the excess 1,5cm from the sides before cutting my precious fabric. As far as the fabric choice is concern I will probably choose a solid or a floral fabric. Overall, I have to say that I enjoy wearing it even though it isn’t my best make. 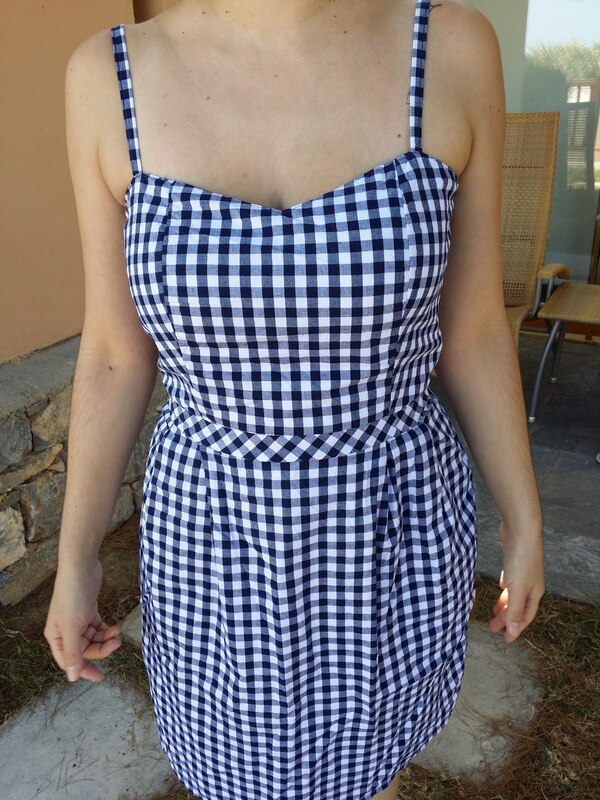 I really love that gingham fabric! Can you believe it? 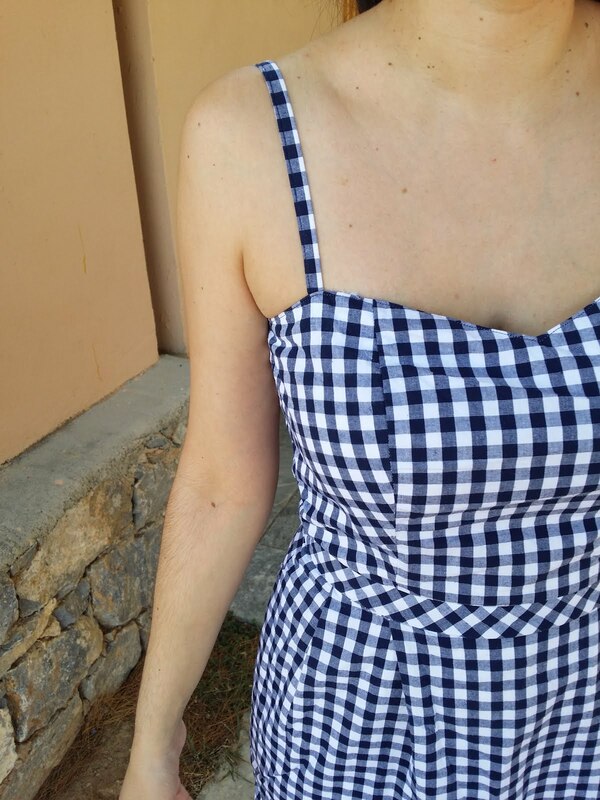 This was the first time for me, making something in gingham! I see more gingham garments to come! This is gorgeous! I love the fabric and the pattern looks lovely on you.